So I decided what the heck, I would build a Chewie. I have bought the platform boots (Demonia) and created a mesh suit based on directions here. I ordered an Evil Chimp mask and Chewie-Changa toes (both of which are not here yet.) as well as a ton of Kankelon hair. Well done for choosing a great costume!! One thing to keep in mind is your leg bump. The platforms will work a treat just make sure you conceal the bridge between your actual toes and your knees so that it blends in . Thanks for the feedback. Can you explain the bridge concept between my toes and the knee? how would I hide that? As to the mesh on my hands, it actually goes past my hands, it is just pulled up here. I have the same boots and I'd advise going for the shortest toes you can do. As you can see from my build (and some others with these boots) by the time you add the toes the length makes our feet too long in appearance and it is difficult to do the bowlegged walk that Meyhew made famous, and also difficult to walk in at all (at least for me). If your going to buy your toes, make sure you cut any extra length off, I just cemented my Ryan Ricks toes on and regret not reducing them first. Also note that they only add about 5 inches to your height, not the 7 that they advertise. You can get another 3 or so inches from your mask so as long as your 6'4 or so you will get to the 7 foot mark. I'm guessing Zero may be referring to flaring your suit out a bit starting from the knee so you don't get a "shelf" at the top of your boot. Try to balance as skinny as legs as possible (see movie photos) but transition the knee to top of foot so you don't get a flat top of boot look. Yours doesn't look too bad but it is difficult to see without a profile shot. Thanks, that makes sense. I have finished one leg's front with the grey. I made the adjustment to put it more on the front. I also took a side pic to get some advice on the foot bump. I really appreciate the help!! as Johnny said, its to eliminate the shelf look. Yours isnt too bad, but i would still do it more so that it tapers off and doesnt look like a gigangtic foot! Actually I was going for the Revenge of the Sith look. 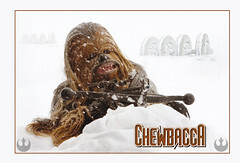 While Chewie is WAY cooler in the original trilogy, I like the more brown look better. how tall are you without shoes? What is your height with the boots on? I am 6' - 6'1" without the shoes. With the shoes and the lifts I put in them, I am 6' 8". If needed, I was going to add some matting to the bottom of the boots. What lifts are you using inside the boots? I tried a couple of lifts (including some that fit together like legos) to try to get closer to Meyhew's height, but could not get them to work with the boots. There just wasn't enough space left for my foot, or if there were the top of my foot would scream after only wearing for a minute or so. I thought with my skinny feet I could get them to work but it was a no go. They are like legos when you put them together. They make it hard to zip the boots, but I bought a size bigger and if you push your heel as far back and away from the zipper as possible, they work. I have not had problems walking in them. Those are the exactly the ones I bought. I even took out the little air wedges without success. Perhaps my problem is that since I wear a size 13 shoe, I couldn't go with a 14. I can make them work on lace up shoes and my vader Chippewas but not these Frankenstyle ones. I'm glad you figured them out. On that note, any thoughts on where I can get a pattern for the satchel?